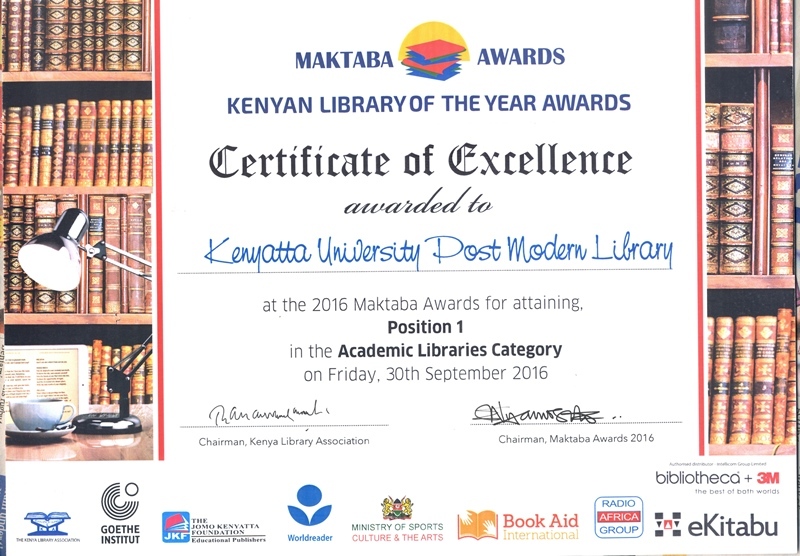 Kenyatta University Post Modern Library has been Awarded a Certificate of Excellence in the Academic Libraries Category at the 7th edition of the Maktaba Awards Competition Gala held on Friday, 30th September 2016 attaining Position 1. The awards recognize excellence in the provision of Library and Information services in Kenya. Currency, diversity, and relevance of the library collection. Innovation and creativity in service provision. Application of modern technologies in library services. Collection, preservation and dissemination of local content and indigenous knowledge.